Every year as a family we go pick out a Christmas tree. I can't believe we're already doing it again! 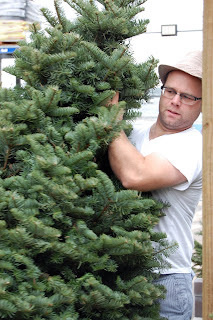 So we traveled to the local hardware store and Luke pulled out 20 trees and we mostly said, "No, yuck, that poor tree!" until we narrowed it down to these two. We let Amaleah make the final decision, and the tree is lovely! I love this little tradition of ours, with the girls hiding in and out of trees, and soon Landis will be too. For this trip, he just slept in my sling, which was nice too. 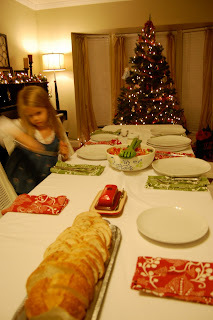 Amaleah setting up for our early Christmas feast (Pumpkin Ravioli) with my brother and his family, since they will be out of town for Christmas. 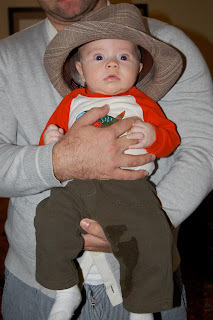 And this is just a freeby of our cute little Landis, already trying to be like Daddy. Did you ever post your recipe for pumpkin ravioli? That sounds so yummy!